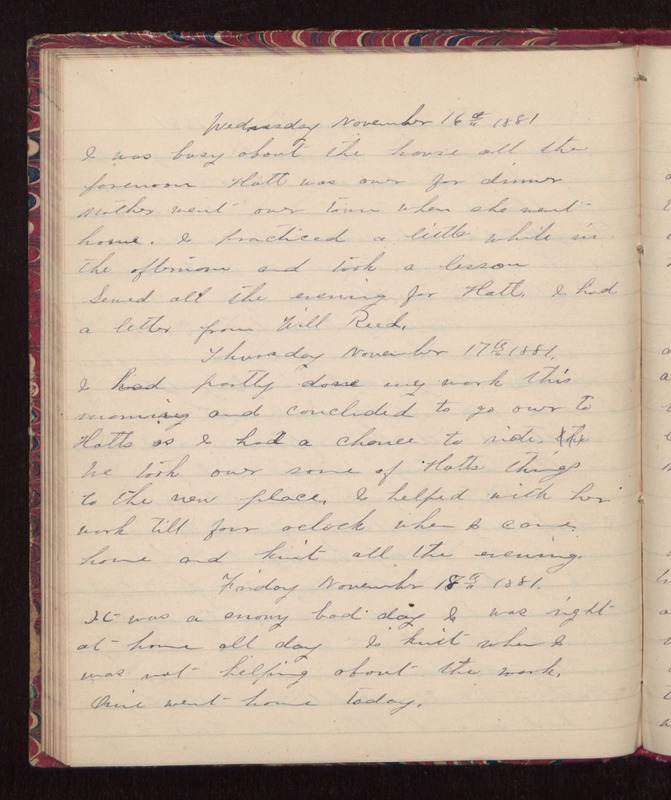 Wednesday November 16th 1881 I was busy about the house all the forenoon. Hatt was over for dinner. Mother went over town when she went home. I practiced a little while in the afternoon and took a lesson. Sewed all the evening for Hatt. I had a letter from Will Reed. Thursday November 17th 1881. I had partly done my work this morning and concluded to go over to Hatts as I had a chance to ride. We took over some of Hatts things to the new place. I helped with her work till four oclock when I came home and knit all the evening. Friday November 18th 1881. It was a snowy bad day. I was right at home all day. I knit when I was not helping about the work. Orrie went home today.